When President Trump signed the Tax Cuts and Jobs Act into law, he introduced several significant changes to existing tax code, including the creation of new tax brackets, the expansion of some popular tax credits and the elimination of others. 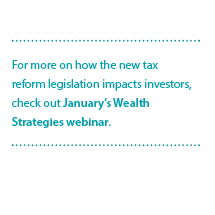 This month’s Wealth Management Insights looks at some of the more notable changes taxpayers should be aware of. The new tax law introduces several fundamental changes to tax rates and credits. Tax rates fell at nearly all income levels, although some ranges will see a slight increase – specifically, income between $400,000 and $425,000 for couples and most income between $157,500 and $425,000 for singles will be taxed slightly higher than in the past. The child tax credit has been expanded from $1,000 to $2,000 per child, and there is a new $500 credit for other qualifying dependents as well. This is one of several provisions in the new law that will sunset after 2025 and revert to pre-2018 levels. While the new law doesn’t eliminate the Alternative Minimum Tax, it does reduce the number of people affected by it. It repeals the corporate AMT, increases the AMT exemption amount for individuals and couples, and increases the Adjusted Gross Income level at which the exemption is phased out. The new legislation also made important changes to popular deductions. While the new law repeals the personal exemption – the $4,050 deduction allowed for taxpayers and dependents in 2017 – it increases the standard deduction by $5,500–$11,000, depending on filing status. The itemized deduction for state and local taxes (SALT) will be capped at a total of $10,000. This limit applies to the combined amount paid in income, sales and property taxes. Mortgage interest is only deductible on up to $750,000 of debt for loans acquired after December 15, 2017. Mortgages in place prior to that date are grandfathered under the old $1 million limitation. A mortgage on a second home is still deductible, but the deduction for some home equity loan interest was repealed. Owners of pass-through businesses (partnerships, S Corporations and sole proprietorships) will be able to exclude 20% of the business income from tax. Limitations apply, however, based on the type of business and the taxpayer’s total income. The legislation includes other important changes for estates and education savings. While businesses structured as pass-through entities are eligible for the above-mentioned 20% exemption, those operating as C Corporations are subject to a new 21% tax rate, a significant decrease from 35% in 2017. The estate tax exemption, which was $5.6 million in 2017, has doubled to $11.2 million per person or $22.4 million per couple. 529 plans have been expanded, allowing up to $10,000 per year to be withdrawn for K–12 expenses, a feature previously limited to Coverdell Education Savings Accounts. The new tax reform legislation could have a major impact on taxpayers’ planning decisions in 2018 and beyond. Each person’s circumstances will vary, and we strongly recommend you contact your CPA and Baird Financial Advisor to see how the new law affects your financial plans.